Some people shape their lives through the influence of their parents. All of Johann Sebastian Bach’s children became major composers. 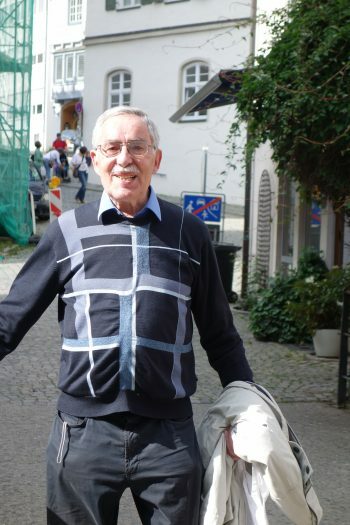 Martin Traenkle, 76, grew up after World War II. His father was dead and his mother, who had been ardent Nazi, raised him and his three sisters with an iron hand. He said Jews were never mentioned in his family; he decided he wanted to meet some. Like many of his future decisions in life, his mother disapproved. He attended a trial in Stuttgart where Nazi leaders were called to account. He was outraged at the way the judge treated the Jewish witnesses, some having come from as far away as Israel. Despite his mother’s opposition, Martin went to Israel with a youth group. The conflict with his mother took such a toll that he suffered a severe depression. He was nursed back to health on a kibbutz near Haifa, where he picked oranges and olives for seven weeks. His life was never the same. He became a Protestant minister and along the way, learned Hebrew, ancient and modern and moved to Ulm, birthplace of Albert Einstein. While working for 25 years in a small church, he became president of the Deutsch-Israelische Gesellschaft (German-Israel Society) and made 10 more trips to Israel. Conflict with his mother continued throughout his life. He told one story about their differences: They debated whether May 8, 1945 was the day Germany surrendered to the Allies and was defeated or was it the day Germany was liberated? His mother never wavered in her support of Hitler. She died on May 8, 1985. Back to the stained-glass window. 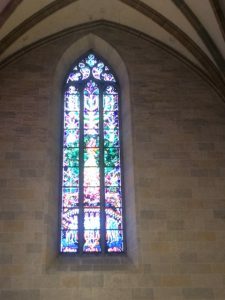 It replaced what was called the “Kaiser window,’ destroyed during WW II bombing of Ulm. The Protestant minister of the church led the sometimes-controversial effort to install the Jewish window. 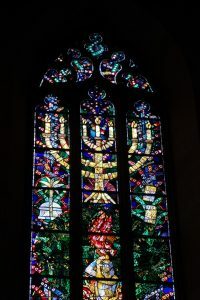 It is an eye-catching collection of Jewish icons, including a menorah, the burning bush and at the bottom, a depiction of Jewish victims of the Nazis with Auschwitz, Bergen-Belsen and Treblinka spelled out in stained glass letters. 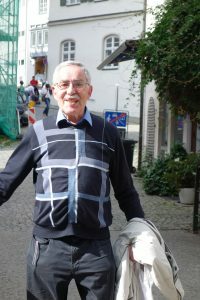 Martin described the up and down history of the Jews of Ulm, having been driven out sometimes and in 1870, enjoying full rights until Hitler. Our talk in Ulm was in the Neue Synagogue, which was dedicated three years ago. In Germany, no Jewish events can be held without high security measures. We had to bring our passports and go through vigorous screening to enter the building. Martin exuberantly introduced us. Oh yes, during the tour of the church he burst into song at one point, filling the space with rich sound. He sang in the church choir there for 32 years until he took up playing the oboe. That day he gave us the tour, he sang a Jewish prayer in Hebrew.